This year has been transformational for the ride hailing sector in Southeast Asia according to a recent joint report by Google and Singapore’s Temasek Holdings. With the merger of Grab and Uber in March, and the latter’s withdrawal of services from the region, Grab has consolidated its leadership in the sector. Soon after, Indonesian ride hailing unicorn, Go-Jek announced a regional expansion plan covering the two largest ASEAN markets after Indonesia – Vietnam and the Philippines – as well as other promising markets like Singapore and Thailand. In the midst of this excitement, it is estimated that consumer adoption of ride hailing services will continue to quadruple from 2015 levels to eight million ride bookings daily with 35 million active users. 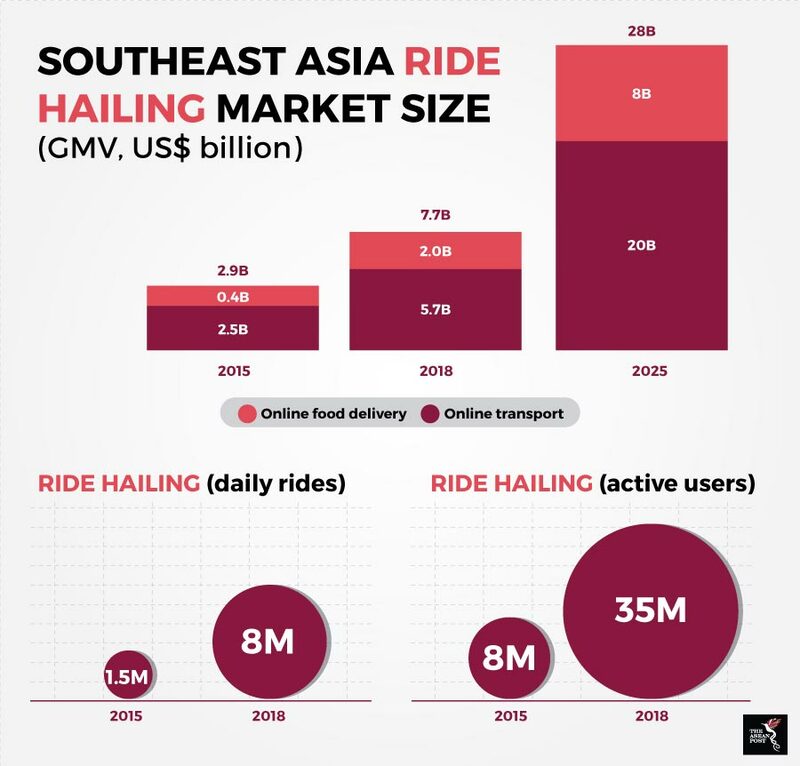 Despite this growth, there is enormous headroom for the sector to still grow further as more than 80 percent of Southeast Asian internet users are still not active ride hailing users. The ride hailing sector which includes online transport and online food delivery has reached US$7.7 billion in gross merchandise value (GMV) in 2018 growing at a compound annual growth rate (CAGR) of 39 percent since 2015. These services are widely available in more than 500 Southeast Asian cities. Moving forward, the ride hailing sector is projected to be worth close to US$30 billion by 2025. Ride hailing has gained incredible traction in Indonesia, reaching US$3.7 billion in 2018 after growing at a CAGR of 58 percent since 2015. It is now the largest and fastest growing market in the region. Online food delivery has also seen explosive growth exceeding US$1 billion in the country. Singapore comes in as the second largest market in the region despite a significantly smaller user base. In 2018, it recorded an estimated US$1.8 billion in GMV primarily due to fares for online transport rides and online food delivery orders which can be five to 10 times higher than markets like Indonesia or Vietnam. Since their launch in Southeast Asia, ride hailing players have been actively focussing on acquiring users and expanding geographically. The main tussle for dominance in the region is between Grab and Go-Jek. Leveraging on promotions for riders, incentives for drivers and aggressive marketing campaigns, the two giants have been attempting to stamp their mark as the dominant ride-sharing player – more so for Grab which has a wider regional appeal than Indonesian-focussed Go-Jek. Beyond transport and food delivery services, ride hailing players like Grab and Go-Jek have increasingly been looking into a third area of focus – online financial services. Digital payment solutions by the two brands have been gaining user adoption thanks to their convenience, benefits and rewards system. Grab and Go-Jek have also started offering future services like money transfers, personal lending, insurance and investment products. Such initiatives will face stiff competition from existing banking and financial players and will inspire a wave of new fintech start-ups aiming to win the hearts of Southeast Asia’s internet users in the still largely untapped online financial services space. Southeast Asia’s internet economy is slated to be worth more than US$240 billion by 2025 according to the joint study. The region’s internet economy has hit an inflection point primarily due to its growing internet base. Previous projections foresaw a US$200 billion internet economy for the region by 2025. However, that number has since been revised upwards by US$40 billion thanks to drastic market acceleration in industries like e-commerce, online media, online travel and ride hailing. It is estimated that due to an increasingly engaged internet user base, Southeast Asia’s internet economy has reached US$72 billion in GMV for 2018 across these industries. This represents a growth of 37 percent from the previous year and has accelerated beyond the 32 percent CAGR recorded between 2015 and 2018.